Providing excellent medical care is your number one goal. For you and your staff, caring for others isn’t a job, it’s a passion. That dedication drives you to do more – like constantly looking for ways to improve your services. That’s why you only gives your patients the best; what would be good enough not for a client but for a family member. We innovated the original, exclusive Comfort Care® line of patient apparel with exactly that reason in mind. These gowns feature exceptionally cozy fabric that is so soft, you have to touch it to believe it! All the Comfort Care gowns and robe have a comfortable, luxurious feel, due to the warm yet light and breathable fabric, which drapes like a natural fiber cloth. The gowns have modern colors and stylish satin trim for a touch of elegance. The line is available in variety of styles to accommodate a number of procedures – IV, mammography, surgery, cardiology, imaging, women’s center and more – and offer a full cut for optimal coverage. The full-length, reversible gowns are versatile and may be worn as front and rear-opening. We promise that switching to our Comfort Care product will improve your patients’ perception of your facility by at least 50% compared to your previous medical gowns. If it doesn’t, we will give you one free month of service! Click on the thumbnail below to see our Comfort Care products up close. A unique way to set your practice apart, this shorter-length gown features the same secure styling as our other front wrap gowns in our plush, warm fabric. 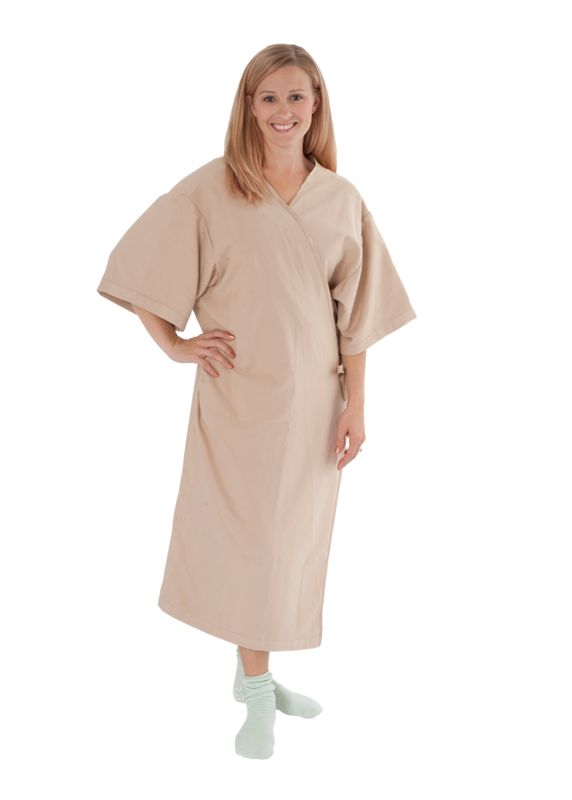 A great way to show your patients you care, this lightweight yet warm, plush gown has a full cut to fit a variety of patients and can be worn as a front or rear opening gown. With a wrap-around attached belt, a generous cut and stylish trim, this robe is a great way to increase patient comfort. With a generous cut and inside and outside ties to ensure complete coverage whether it opens in the front or the rear, this versatile gown is guaranteed to increase patient comfort. This lightweight, plush front-opening gown has a full cut to fit a variety of patients. Ideal for OB/GYN, oncology centers, imaging center, women's health centers and more. This new elegant and plush V-neck gray gown with dark gray satin trim is designed for patients who need a dedicated intravenous line with snaps along the shoulders and upper arm for easy access. Additionally, an off-center breast telemetry pocket allows wires to pass inside the pocket, staying out of sight. Hear Directly From Patients: Read what patients have to say about the Comfort Care line! Like all our linen, the Comfort Care line comes with a worry-free, complete linen program, complete with a dedicated representative, which we call a “Customer Advocate.” This representative is an extension of your team: delivering your individually-packaged gowns, stocking your shelves, managing your inventory, and more. Want to become a believer? Contact us to request a sample! ImageFIRST is the fastest national linen rental and laundry programs partner of choice, and your cost-effective solution for greater patient satisfaction. Our healthcare-only products also include healthcare bed sheets, microfiber cleaning solutions, scrub uniforms, and more. Product, pricing, and service availability may vary by market. Check with your local representative for information regarding products, pricing, and services available in your area. Participating locations only.